A concept first brought to life in the Andes mountains of South America, the underground greenhouse/walipini has begun to get more widely know around the world. This concept when applied correctly can increase your food production to year round and could be a key factor in growing wholesome, healthy food for you and your family. The earth maintains a steady temperature of around 50 degrees Fahrenheit once you get deep enough. You can capture and store solar energy in the earth walls of the greenhouse which will release as heat as the greenhouse cools down. 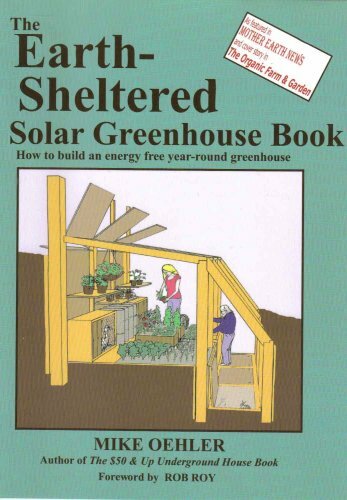 I know it's a bit cliche but it's true, when you are considering where to position a underground greenhouse. You need to have a spot where the water table is below the greenhouse a minimum of five feet at the wettest time of the year. The five feet will give you wiggle room for when you get unexpected heavy rains or snowfall that might raise the water table. The second is your solar exposure, you want to have a spot that is high, dry and will give you a unobstructed view of the southern sky, if you live in the US. Any trees or buildings that shade the greenhouse will significantly reduce its heat gain in winter. Like I said above you want to orient the structure facing south, but you also need to take into account the angle of the sun as it impacts the glazing of the greenhouse. You will want to angle your glazing at the correct pitch to catch the maximum amount of sun you can during the coldest season. If your glazing is pitched incorrectly you will reflect much needed sunlight away from your greenhouse. To calculate the pitch you will need a very simple formula and the latitude of your location. The Earths axis is tilted at about 23 degrees in relation to the sun, so all you have to do is take the 23 degrees and add it to the latitude of your location. This will give you the correct pitch for your glazing so that the sunlight hits it at a 90 degree angle and penetrates effectively into the greenhouse during the coldest part of the year. For example if you take the latitude of South Dakota which is around 45 degrees and add it to the 23 degrees of the Earth's tilt you would get a total of 68 degrees. Which will give you a glazing pitch that is almost vertical. Knowing that you might decide it is easier to build a vertical glass wall rather then one that is angled back at the top slightly. This will cause you to lose some solar efficiency but it can be easier to build. Venting is one of the most important things you can do for a greenhouse, whether it is a underground or above ground. You will always have to vent the greenhouse at some point to get rid of excess moisture, heat and bad smells. Venting can done by using powered fans or by simple, well placed doors and windows that can be opened. The most basic method of venting is to have openings into your greenhouse at the lowest and highest points of the structure. As heated air rises and goes out the top vent, it will draw cooler fresh air into the greenhouse at the bottom. This creates a cycle similar to natural convective currents found in the atmosphere but it does require a person on hand to adjust as needed for changing conditions. Another thing you will need to consider is an interior and exterior drainage system for water. Water can pool under the growing beds and may require being drained away so it won't damage your plants. A exterior drainage system may be required to direct excess water away from the walls of your walipini. You may also have to add in some sort of heating system to help out on those really cold days. This can be something fancy like a temperature controlled propane heater or a simple wood stove that you light as needed. The nice thing about including a wood stove is that it can be used for venting when it's not lit. For more great info you can check out the Walipini Construction (The Underground Greenhouse) guide which can walk you through the entire process step by step. This guide is designed for the southern hemisphere so the diagrams and pictures won't work as a template, but you can follow the instructions to build your own as long as you keep that in mind.